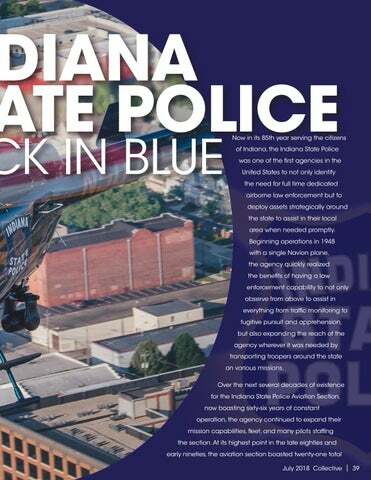 INDIANA STATE POLICE The Indiana State Police Aviation Section returns to prosperity from the brink with new assets and a new plan. The Australian rotorcraft industry puts on a successfull event to showcase the best in aviation downunder. ECHO continues its drive nationally, hosting a tacctical fligth academy in Orlando, Florida. of the publisher. Content within COLLECTIVE is believed to be true and accurate and the publisher does not assume responsibility for any errors. Unsolicited editorial manuscripts and photos are welcomed and encouraged. COLLECTIVE cannot be responsible for return unless submissions are accompanied by a stamped, selfaddressed envelope. Photos submitted by mail or electronically become property of COLLECTIVE unless otherwise specified. Copyrighted photographs must be clearly marked, otherwise they become property of heliweb. Deadline for all advertising is the first day of each month for the following months edition. Information about rates, requirements, etc. is available upon request. mistakes over and over that continue to cost lives, despite all of the money, time and man hours that have gone into educating and training the industry to prevent pilots frtom making the mistake of taking these flights in conditions like the one I mentioned. The NTSB also noted that the aircraft was airborne for less than 90 seconds...that astounds me, and other pilots that I have discussed this with on many levels. If it was bad enough to get into an unrecoverable position within a minute and a half, there were other signs well before that, including a 300 foot ceiling as reported by witnesses on the ground. Always having an affinity for writing and later photography and videography, Ryan started out as a photographer and writer for several aviation magazines before having the opportunity to take over Collective Magazine and produce the type of content that readers want to see every month. I see some on the internet say things like “you shouldn’t talk about a pilot that can’t speak for themselves.” Well, sure, but how does it help the industry if we don’t talk about how we don’t repeat the same mistakes? Social Media Manager An aviation writer and photographer for many years with multiple publications. He also serves in the Texas State Guard and is pursuing a private pilot rating while working a full-time job and traveling for the magazine throughout the year. While there is no perfect solution to this problem, I do think that there is an underlying issue beyond what I have mentioned within this column. It could even be a mix of several issues that need more than catch phrases, checklists and wall posters to fix it. We have to change the way people think and somehow prevent those single decisions that begin the error chain that results in loss of our friends. A writer and professional photographer for over a decade, Sara specializes in photography that captures the human element. She recently received national recognition for her work in producing a yearly calendar that showcases the real life of those in law enforcement. Dan Foulds retired from flying in 2015 after a 30-year career in flying in military & civilian aviation. Dan now runs HelicopterEMS.com and spends his time dedicated to helping improve air medical crew safety and single pilot operations. Helicopter FAA Designated Pilot Examiner, conducting Private through ATP level exams in numerous types. His experience spans; Air Medical, Law Enforcement, Flight Instruction and ENG Flying. A 3 time Master Instructor, FAA Gold Seal Instructor, USHST Rep Human Factors Group and FAASTeam Rep Greater Cincinnati Ohio region. Writer & Photographer Starting his aviation photography career almost a decade ago, he has been published in both national and international aviation publications featuring his work with both jets and rotary aviation. HELICOPTER PARTS SALES Check Out our Huge Inventory! Over One Million Items! JOIN THE AVIATION COMMUNITY FOR THE 14TH ANNUAL CHC SAFETY & QUALITY SUMMIT! BUILDING SAFETY AT EVERY LEVEL Does this start at the top or with front line employees? Lightning striking in the distance while sunset lights up these AS 350 B2s. in Brazil Photographer: Ricardo SĂĄ. A Norwegian NH90 being put through its paces. Photographer: Jeroen Van Veenendaal. From the West Valley Fire in the Pine Valley Mountain Wilderness, Southwest Utah. Photographer: Jonathan McNally. #helipix A Connecticut National Guard Blackhawk spying another slinging a 105mmHowitzer . Photographer: Sgt. 1st Class Edward Dettore. A Robinson R66 Turbine Marine under the rainbow in Eastern Finland. Photographer: Mikko Nevalainen. #helipix An EC130 T2 operated by Helinet Aviation divng through the sunset over Santa Monica, CA. Photographer: Jason Jorgensen. A irb u s H e licopte rs’ H 1 7 5s ope ra te d b y H on g Kon g’s G F S . P h o t o : E r i c Ra z .
our response capability but also be able to intervene in the most complex situations and in a large variety of scenarios.” GFS’s new H175 will progressively replace their current fleet of AS332 L2 and H155, which currently provide 24hour emergency support services from their base at Chek Lap Kok Airport. “I am grateful to GFS for their constant support and I am committed to ensuring that the H175 will fulfil their most demanding operations” said Bruno Even, Airbus Helicopters CEO. “We are very honoured to have the confidence of a world-renowned public service and SAR operator and longstanding customer to introduce this latest version of the H175 into service. With 23 aircraft currently in on worldwide, the H175 keeps delivering on its promises in terms of performance, range and cabin comfort for oil & gas, private and public services customers”. The public service version of the H175 benefits from more than twenty cabin configurations which can be easily re-configured based on mission requirements. The great versatility of the aircraft is backed by approximately seventy different types of optional equipment which include an electro-optical system for observation and tracking and a digital map display, both of being managed by an operator’s console installed in the cabin. Mission equipment also includes a dual hoist, a search light, an infrared camera, as well as a radioactivity detector, which is a GFS-specific equipment. The H175 benefits from the latest developments of Airbus Helicopters’ state-of-the-art Helionix avionics suite, which bolsters the helicopter’s search and rescue capabilities with advanced SAR modes, allowing for instance the aircraft to hover automatically above moving vessels. Reg a’s two new A irb u s H 1 45s. Airbus Helicopters has delivered the first two of a total of six H145 helicopters t o S w i s s A i r - Re s c u e Re g a . T h e s e w i l l r e p l a c e Re g a ’s ex i s t i n g f l e e t o f E C 1 4 5 helicopters, which will be p h a s e d o u t b y m i d - 2 0 1 9. Pho t o : C hr is t o phe Ke lle r.
providing airborne medical a s s i s t a n c e t o a r o u n d 6 0, 0 0 0 patients to date. Thanks in part to these positive ex p e r i e n c e s ; Re g a i s n o w opting for the H145, the successor to the EC145. “The H145 represents a continuation of our success story and ensures that we can continue to provide our patients with reliable and professional help in the years t o c o m e ,” s a i d E r n s t Ko h l e r, C E O o f Re g a . “ We a r e p r o u d t h a t s u c h a n internationally renowned o p e r a t o r a s Re g a h a s p l a c e d its trust in our H145 family over such a long period of t i m e ,” s a i d Wo l f g a n g S c h o d e r, CEO of Airbus Helicopters Deutschland. T h e H 1 4 5 i s t h e m a r ke t leader for police and rescue missions with a combined fleet of over 200 helicopters worldwide, which have jointly accumulated more than 1 0 0, 0 0 0 f l i g h t h o u r s . T h e agile H145 is particularly well suited for special intensive care transports thanks to its spacious cabin and a m a x i m u m t a ke - o f f w e i g h t o f 3 .7 t o n s . T h e h e l i c o p t e r s are equipped with the Helionix digital avionics suite, providing user-friendly flight data management and a high-performance 4-axis autopilot, which considerably reduces pilot workload during missions. Its particularly low a c o u s t i c f o o t p r i n t m a ke s t h e H145 the quietest helicopter in its class. 5% SAVE 35-8ce! i off list pr Call Today! Used Bell parts are %50 off! sales2@preferredairparts.com Sales Hours 7:15am to 5:30pm EST. We Buy Worldwide We are Cash Buyers! We buy inventories of new surplus parts for nearly anything that flies. Also tired or damaged Cessna twins, Caravans, Citations, engines and propellers. The German Bundeswehr’s final H135. Photo: Christian Keller. the U.S. arsenal,” said Chris Gehler, Bell Vice President for the V-22 Program. “This multiyear production contract provides program production stability through at least 2024.” The U.S. Navy will use its new CMV22B variant begins modernization of U.S. Navy carrier onboard delivery fleet, for transporting personnel and cargo from shore to aircraft carriers, eventually replacing the C-2 Greyhound, which has been in service since the mid-1960s. A Bell Boeing MV-22B Osprey. Photo: Jason Jorgensen. Metro Aviation Delivers H145 to Avera Careflight aircraft have been impressed by the workmanship.” This is Avera’s first H145 and first aircraft in their fleet to be equipped with Oute rlink’s IRIS system for satellite tracking, push-to-talk radio, flight data monitoring and voice and video recording. Avera Careflight H145. Photo: Metro Aviation. By the end of the year, Avera will have one more refurbishment completed by Metro to bring their Sioux Falls-based fleet to two EC145 C2s, one H145 and two Pilatus PC-12 fixed wing aircraft. Avera Careflight provides transport in the areas surrounding their bases in Sioux Falls, Aberdeen and Pierre, S.D., as well as throughout the Upper Midwest. Leonardo AW169 departing HAI Heli Expo 2018. Hungarian fleet also will be equipped with a fast-roping system, highperformance camera, fire-support equipment, ballistic protection as well as an electronic countermeasures system. The 3.7-ton mtow H145M can be used for a range of military tasks, including troop transport, utility, surveillance, air rescue, armed reconnaissance, and medical evacuation. The twin-engine H145M was first delivered in 2015 to the German Armed Forces and has since been ordered by Thailand and the Republic of Serbia. Helicopters in service have a dispatch rate of greater than 95 percent, according to Airbus. The H145M is powered by two Safran Arriel 2E engines and equipped with full authority digital engine control and the Helionix digital avionics suite that includes a four-axis autopilot. not only be at the forefront of this critical initiative but also to now be able to deliver this life-saving equipment to European o p e r a t o r s a s w e l l .” The CRFT was created to replace legacy AS350 models such as the AS350D, AS350B/B1/B2/BA/B3 and AS350 B3e (H125), and the EC130 B4. StandardAero provides installation and technical support for the kit, which is field replaceable. With a slightly greater capacity than the legacy fuel cell, the CRFT features magnetic field sensors f u e l g a u g i n g t e c h n o l o g y, a recessed sump drain valve, quick-change cartridge fuel pump design and vent system roll-over protection. A d d i t i o n a l l y, t h e C R F T c o m p l i e s w i t h t h e FA R Pa r t 2 7. 9 5 2 f u e l s y s t e m c r a s h resistance requirements and is compatible with the manufacturer’s cargo swing and other cargo swing solutions. S i n c e t h e C R F T FA A approval, StandardAero has delivered 40 kits to customers such as Air M e t h o d s a n d W e a t h e r Te c h Aviation, who also served as its launch customers. Both StandardAero and Robertson Fuel Systems recognized Air Methods at Heli-Expo in L a s Ve g a s e a r l i e r t h i s y e a r during an event celebrating the 11 CRFT retrofits that had taken place at that time. keynote addres s t it led “Never q u i t, Never give up, fight unt il t he e n d - Mit igat ing R is ks ” was a hit wi th convent ion at tendees. We caught up wit h Chuck du ri n g R otor tech to dis cus s his prese n ta ti on and his t hought s on t he Aus tra li a n helicopter indus t r y. One of the attractions this year was one of the first Bell 505x Jet Rangers in Australia (VHVSB) owned and operated by Nautilus Aviation in Far North Queensland. McDermott Aviation had a Bell 214B on static display illustrating the size difference in bucket capacity between both buckets the 214 is capable of deploying. much that has not been thought o f i n av i a t i o n . yo u h ave to re a ch outside the box and you just g o t t a d o i t m e t h o d i c a l l y.â&#x20AC;? A l l i n a l l , t h e R o t o r t e c h s h o w, while still smaller than otherts a ro u n d t h e wo r l d i s a wo r t h w h i l e i nve s t m e n t fo r t h e Au s t ra l i a n Helicopter industr y and those seeking to market themselves within it. Later this year will see the launch of discovery yacht “Scenic Eclipse” from the founder of travel company Scenic. Part of this project includes 2 aircraft which have been selected as The EC130T2. Pacific Crown will provide the base support role in this project. This is the first of the two EC130’s Pacific crown are fitting out for the project. 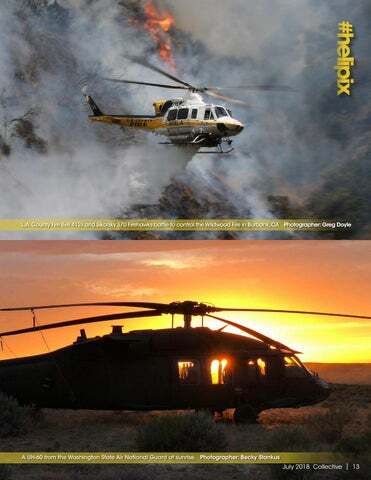 â&#x20AC;&#x153; This is one of those shows that you have to be at, we attended the HAI Heli expo in the United States to wave our brand name internationally and for us Rotortech being on home soil is such a fantastic network event and also helps with future orders of our product from new and existing clients with our custom made one and two piece flight suits.â&#x20AC;? was one of the first agencies in the United States to not only identify the need for full time dedicated airborne law enforcement but to deploy assets strategically around the state to assist in their local area when needed promptly. Beginning operations in 1948 with a single Navion plane, the agency quickly realized the benefits of having a law enforcement capability to not only observe from above to assist in everything from traffic monitoring to fugitive pursuit and apprehension, but also expanding the reach of the agency wherever it was needed by transporting troopers around the state on various missions. dwindled to a single remaining 1984 model Bell 206 Longranger as two Bell 206 helicopters sat in the hangar unable to fly. A far cry from what was at one time considered one of the largest aviation units in the country. Hamilton County, IN in November of 2002. Indiana limits a Sheriff term to two consecutive four year terms, which resulted in Carter leaving the Sheriff’s office at the conclusion of his second term in 2010.
language and hear the frustration in his voice as he highlighted events where he believed, had the assets to respond been present, the outcome could have been very different. Carter detailed specific instances, like that of a lost elderly patient in Northern Indiana that walked away from a nursing home - found later the next day deceased in the snow, or a five-year-old child that drowned in a lake in Southern Indiana. that people died.â&#x20AC;? said Carter. Even with careful planning, it still takes time, and a little luck for plans put in motion to reach the execution stage. As with many government agencies, there was much red tape between the sale of one aircraft and the eventual upgrade completion of another. The sale of the Beechcraft King Air netted the agency a $1.8 million windfall with which to work with on the Longranger upgrade. Though the upgrade took almost two and a half years to come to fruition, it was completed under budget for $1.3 million. multiple units to stay on a target location. through more rapid response time. Police’s aviation section by whoever the next official was that was to fill the role of Governor. technology in the new aircraft and as well as the benefit of increased speed. Within less than an hour the new 407GXP can reach any corner of the east side of Indianapolis. to become the only CFII within the aviation section. realized in May of 2018.
have not lasted long if old practices continued. arriving into service and immediately saving a life. 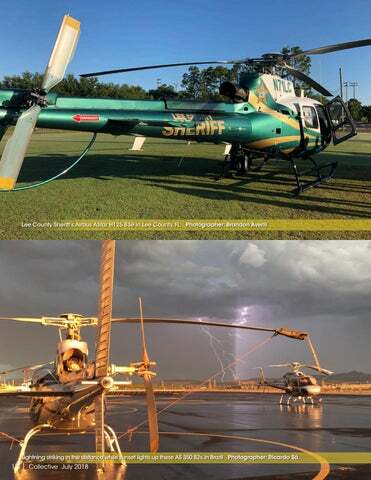 The former East Coast Helicopter Operations organization has gone through a few changes in the last year, the biggest change being the move to partially rebrand as â&#x20AC;&#x153;Every Coast Helicopter Operations.â&#x20AC;? holding and attending these training sessions at a small cost or no cost at all for attendees. ECHO was created and designed as a way to utilize the wealth of knowledge and experiences brought forth by individual flight programs and their crews. ding events and now a larger nual conference that will be d this year in Chattanooga, nnessee September 7-9 at the versity of Tennessee campus. Brent Bundy is a seasoned airborne law enforcement officer. Having some 17 years under his belt in the field, to say he is experienced is an understatement. Now rounding the corner and nearing his retirement, I decided it was time to sit down and discuss his career with him and share what an outstanding human being he is with the world. A 1986 graduate from Genesee, Missouri Michigan, his original plan was a career in the medical field as a doctor. By his freshman year of college, at 17 years old, something clicked, and plans changed. A friend at the time was majoring in Criminal Justice alongside him and after investigating the field further, Bundy was hooked. â&#x20AC;&#x153;It fell in line with the idea of helping people that I desired so it felt like just another way of achieving that goal,â&#x20AC;? Bundy said. By1992, Bundy had begun his career as a Law Enforcement Officer, working 3rd shift patrol in west Phoenix, Arizona. The metropolis he patrolled came with the typical day to day challenges: foot pursuits, perimeter checks, vehicle pursuits, nothing short of non-stop duties. For an officer in his early-twenties, it was a completely satisfactory and fulfilling 9-5. Then one day the hum of rotor blades in the sky above him caught his attention. As a Michigan native, where police agencies were much smaller, Bundy was somewhat unaccustomed to the need for helicopters in the field. He had never even thought about being involved in flying until working the streets of Phoenix with their large, well-established air unit. In a period of more than half a decade as a patrol officer, the interest grew, and the need to get in the cockpit of a helicopter intensified. Once he saw the job up close and in person, he was convinced that was where he needed to be. as a Property Crimes Detective. training in Phoenix PD’s MD 520N. received his private pilot rating. share of challenges and triumphs. Above: Brent Bundy is squalified to fly all of the assets in the Phoenix Police department Aviation Unit. This includes a range of Cessnas, a Pilatus PC-12 , Leonardo Helicopters AW119 and the multiple AS350 models the agency flies. Below: Bundy took up photography as a hobby and once in the aviation unit at Phoenix Police, he was quickly tapped as their go-to guy when it came to taking photos from the helicopter. 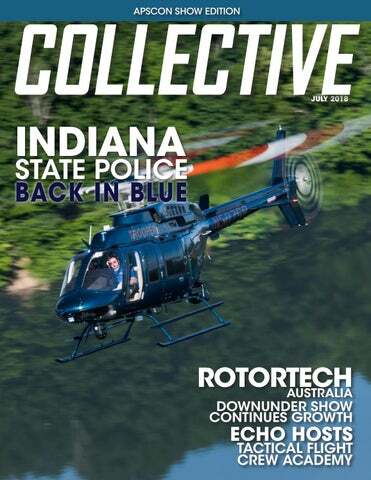 Read about how the Indiana State Police Aviation Section, with a 66 year history went from considering its possible end, to a resurgence bringing with it new aircraft and technology with the help of a dedicated superintendent that refused to give up. 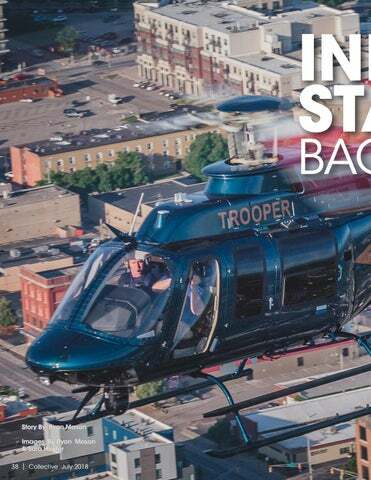 Read about how the Indiana State Police Aviation Section went from on the verge of having no aircraft to provide service to the state, to a unit with the latest technology and aircraft in law enforcement aviation thanks to a dedicated and committed Superintendent. 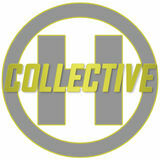 A selection of the best submitted imagessubmitted to us via info@collectivemag.com submit your images now!